WeBS count today, so met JF down at Dru, I've not put any oats out for yonks, but there were 3 linnet on the dunes and offshore was a great-crested grebe, nearly into breeding plumage (a patch year tick! 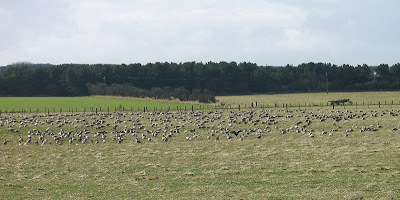 - they have been very scarce in the county this winter). The most surprising bird on the pool was a red..DOH! 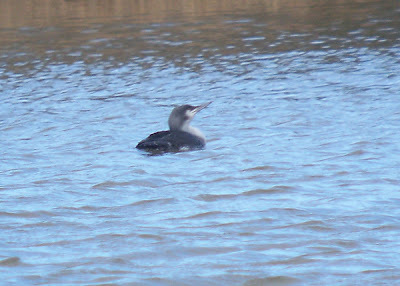 Black-throated diver - nice one for the WeBS count, it's yonks and yonks since I saw one of these on the lake, though they are virtually always present offshore, even in summer. The other highlight was a little grebe, first one on the patch this year. 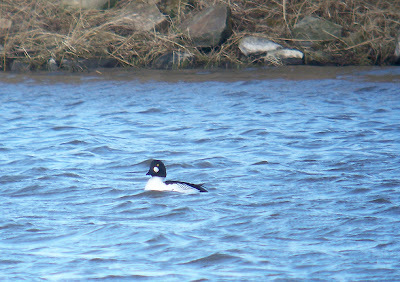 There were also 10 shoveler, 113 wigeon, 72 teal, 14 shelduck and 7 goldeneye. Elsewhere on the patch, 2 pairs of stonechat were on the fence, a grey partridge was on the meadows and the male kestrel was being harassed by a crow, there were also a few mippits back, with at least four by the parking area. The blog will be pretty quiet over the next couple of weeks as I will be on my travels, both work and fun! You sure that's a Red-throat? Why is it not Black-throated? ?